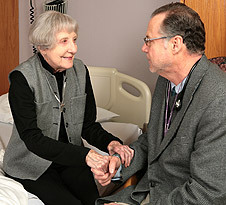 Patients who are referred to our Supportive Care Program have chronic, long-term illnesses that require recurrent hospitalizations and ongoing follow-up, such as persons living with cancer, heart disease, lung disease, kidney failure, AIDS, and cystic fibrosis, among others. Although a referral to our Supportive Care Program can be requested at any time, it is best for patients to access the program early in their illness or disease process. Download our Support Care Brochure.